Your roundabout movie, 2010, consists of a hanging screen in the middle of the room, on which the outlines of a rectangular panel and a slightly larger frame slowly turn. The panel, appearing green, and the frame, appearing pale red, eventually reach a point of perfect synchronicity, with the frame meeting the panel in one flush plane. Walking around the installation, the viewer discovers the mechanism of the work, comprising two slowly turning objects – one on each side of the screen – whose shadows are cast onto the central screen. 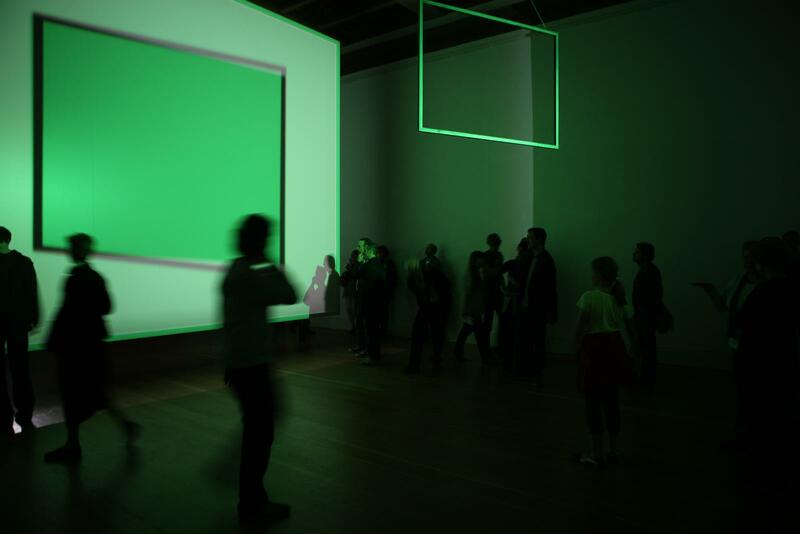 Surprisingly, the spotlights used are green and white – baffling the viewer, who may come to the conclusion that the coloured shadows are in fact an optical illusion.